"A classic caramel apple recipe perfect for Fall entertaining. 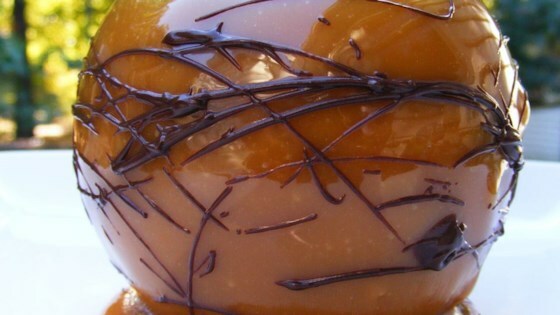 Using caramel candies makes this recipe a breeze." Combine caramels and water in a saucepan over low heat. Cook, stirring often, until caramel melts and is smooth. Stir in vanilla extract. Dip each apple into the caramel and gently run apples around insides of saucepan to scrape off some of the caramel. Scrape excess caramel from the apple bottoms using the side of the saucepan. Place on the aluminum foil and chill until ready to serve. See how to make chewy, gooey caramel apples! I made these caramel apples and they look beautiful, however my caramel is too hard. The consistency is like a Sugar Daddy sucker. What did I do wrong?? Really easy/fun to make! Stick to melting the caramels in the pan rather than the microwave. I've found that the microwave causes the caramels to harden much quicker than if melted on the pan. I make these every year and they are delicious! Does anyone have a great Idea for packaging them to give out as treats to friends. I am afraid they will stick to the paper permanently. The trick is to use wax or parchment paper. Greasing a metal pan does NOT work. Thanks! Great, easy recipe. caramel did not slide off of apples. We dipped them in chopped nuts, let cool a bit and then dipped them melted milk chocolate. A very YUMMY treat! I didn't cook these, so I am only rating the taste. The were about as perfect as a carmel apple can get. Yum, and Thanks! !